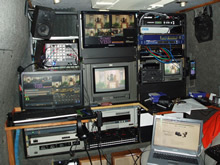 The Edit Source IP Satellite Uplink system offers a cost effective solution and bandwidth on demand for HD/SD satellite transmission. 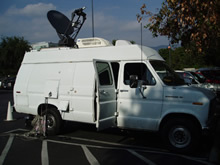 With a price point less than half of a traditional satellite SNG truck The Edit Source Group's new IP Satellite gives you the power to transmit and receive media via a comprehensive package of transmission equipment in a compact footprint, getting you on air faster with more features and more flexibility while costing you less time, less money and less manpower. We have a 1 meter Auto-Deploy Satellite Antenna that provide you with Internet connectivity from almost anywhere in Canada, the United States and Mexico as far south as Argentina. 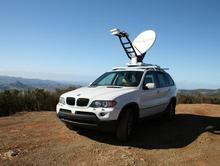 We call our satellite system, “Bandwidth on Board” because you can be in the middle of nowhere and still able to get on the Internet, or for that matter, have phone or Internet service via satellite. MainStage provides an economical, turnkey platform that enables live broadcasting from any event regardless of size or location. Narrowcast events previously ignored by major broadcast networks because of audience size and production expense can now be affordably made available on a pay-per-view, sponsored and/or advertising supported basis to their fans, enthusiasts or members. MainStage includes a unique, easy-to-use production creation tool that provides complete online event set up and management directed and controlled by the producer. This allows for customization of all elements of the production, including the business model (pay-per-view, subscription, sponsored), required registration fields (email address or more), interactive features (includes all major social networks), signal quality (up to highest quality HD -1080P). This event can then be used to create a private label network embedded seamlessly in the client's website.